The HTML5 output will export a project that allows for playback in any modern browser. Below are all the settings for the HTML5 output. Output Folder – All files associated with this output will be added to this folder unless otherwise specified. Its default name is output. Its default location is the same folder as the source image. You can change the output folder’s location by clicking the folder icon and navigating to the new location. Right-click the folder name to change its name or to find the folder’s location in Finder [macos] or Explorer [win]. Each output will create a unique folder name to avoid overwriting previous outputs. Skin – Here you can choose either one of the pre-installed skins or choose one that you have created in the Skin Editor. All skins saved to the default Skins folder will be listed in the menu. Otherwise, use the Open Skin button to add a skin or drag a skin file to the menu. If a skin is found in the same location as the source image, it will also be visible in the list preceded with $d. Right-click skin file to locate the it in Finder or Explorer. The file extension used for skins is .ggsk (stands for Garden Gnome Skin). ★ The skins, simplex and silhouette, are shipped with Pano2VR and use scalable vector graphics. Open Skin - Click to navigate to a skin and to add it to the output. Edit Skin - Click this button to open the currently selected skin in the Skin Editor. Edit Skin Configuration - Click to edit the initial values of exposed variables of the skin. This lets you configure skins to the needs of the current project. For example, if you have a skin that is frequently applied to projects, but a certain element or component (like the cardboard view button) is not always needed, a variable can be applied to that element’s Visible logic block. Then, in the HTML 5 output, you can change the variable’s value. 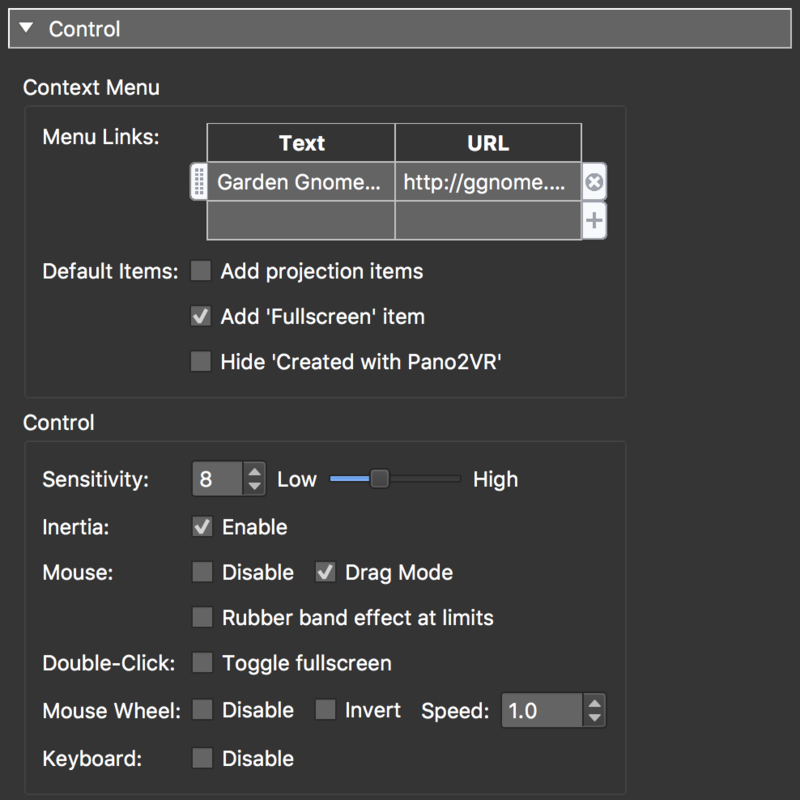 Generate Garden Gnome Package - Clicking this button will output the Garden Gnome Package format that is used for embedding panoramas in a CMS website. Select, Fly In to enable the feature. Speed – Determine the speed of the transition. Animation – Select this to use the custom movement you’ve created in the Animation Editor instead of Auto Rotation. Sequence – Select a sequence to use for the auto rotation. 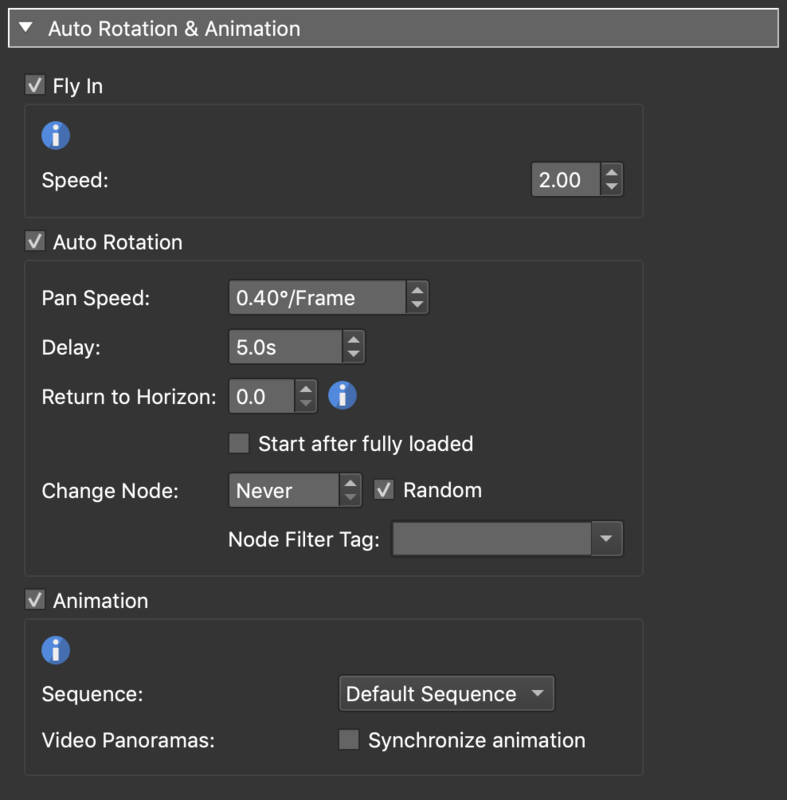 Video Panoramas – Select, Synchronize animation, if you’ve added an animation to a video panorama, you can sync the animation you created in the Animation Editor with the video. This means that whenever the animation begins in the player, it will run in sync with the video panorama. Dip to Color - Use the color picker to the right to choose a color. Soft Edge – Most transition types can have a soft edge. It defines how much the edge of the transition is blurred. Use a low value of around 30 pixels for a subtle motion blur like effect, or a high value of around 300 pixels for a very blurry transition. 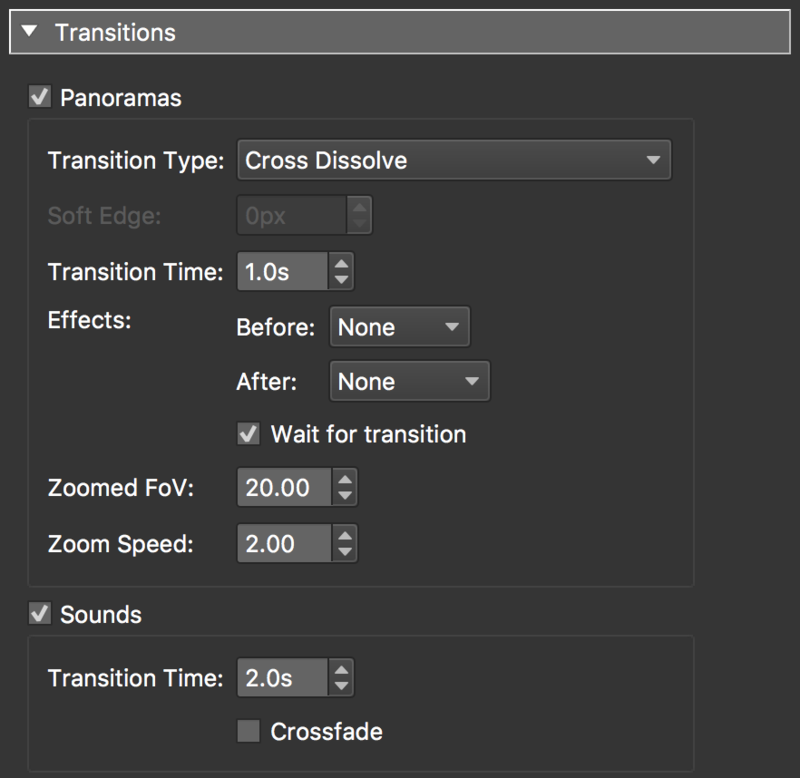 Transition Time – The time of the transition from one panorama to the next, not including the Before and After effects. The default is 1 second. Select to enable transitions for sounds. Transition Time – The full time of the transition of sounds from one panorama to the next. The default is 2 seconds. Crossfade - Select to use a crossfade between the sounds of the two nodes. If this is not selected, the sound of node 1 will completely fade out, and then the sound of node 2 will start fading in. If selected, the sound of node 2 will immediately start fading in, while the sound of node 1 is fading out. ✭ Currently does not work in Safari. Auto - Choose this to have the text automatically fitted within the text box. 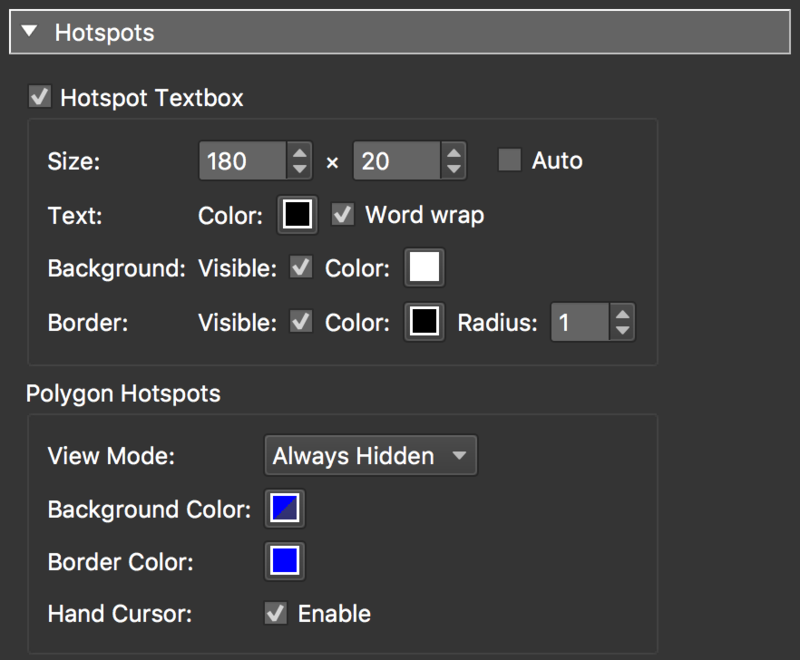 If you’ve added polygon hotspots, then these settings will affect how they appear in this HTML5 output. Show All - All polygon hotspots will be visible when the mouse enters the active area of one of the hotspots. Disabled - The polygon hotspots will not be visible nor active. Hand Cursor – When selected, the mouse cursor changes to a pointing hand cursor when hovering over polygon hotspots. The context menu is the panorama’s menu that pops up when you right-click in the image. Add Projection items – Select to add options for switching the projection in the player. 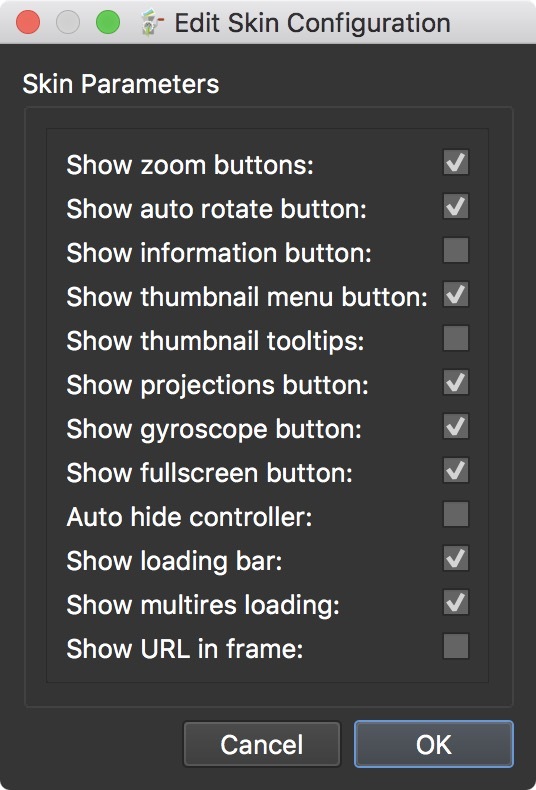 Add ‘Fullscreen’ item – Select to add a menu option to go into Fullscreen mode. Hide ‘Created with Pano2VR’ – Pro - Select to hide ‘About Pano2VR’ from the right-click context menu. Menu Links – Here you can add links as menu items. Double-click in table or click the plus symbol to add the first item. In the top row, click in the cell to add Text and a URL. Click the plus to add more, click the x to delete, grab the handle on the left to rearrange. ✭ Learn how to add a logo to the context menu. Inertia – When this is enabled, the panorama will slowly come to a stop - as if it has mass. If not enabled, it will stop immediately. Disable - Select to disable interactivity with the panorama via the mouse. Drag Mode - Select this (selected by default) to invert the mouse control. When inverted, dragging the panorama with the mouse will drag it in the same direction as the mouse. Also, to move the panorama, the user must click and drag (like Google Street View). Rubber band effect at limits - Select this to enable the rubber band effect so that the panorama can be dragged or pulled beyond it’s viewing limit. Once the mouse or finger releases, the panorama will bounce back to it’s original viewing limit. Toggle Fullscreen - Selects the fullscreen mode on double-click or double-tap when using a touch screen device. With this option, a skin is not required to enter and exit Fullscreen mode. Mouse Wheel – Mouse wheel controls. Disable - Disable interactivity with the panorama via the mouse wheel. Invert - Invert the interactivity of the mouse wheel. For instance, scrolling down will zoom the panorama out (instead of zooming in). Speed - The rate at which the panorama will move relative to the mouse wheel. Disable - Select this to disable interactivity with the panorama via the keyboard. Disable Zoom - Select to disable the zoom function of the player via the keyboard. Quality – The overall quality of the image as defined in JPEG images. 90% is the default value, lowering the value below 90 will decrease the quality of the outputted images. When Manual is chosen, you can enter the level size yourself. In the table that appears, double-click in the empty field, and the first level is added. You can change this value or keep it. Click the plus sign or double-click the field below to add another level. Background Color – Click the color picker to choose the color of the background. File – Rename the Skin file here. This is useful if you want to have multiple versions of a project with different skins share the same output path. This way, you can have multiple skins in the output folder. 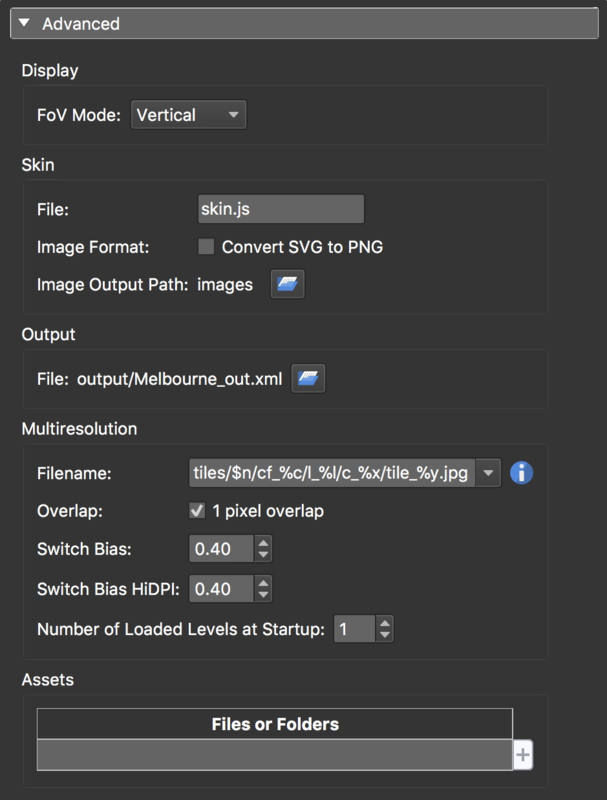 Image Format – Select Convert SVG to PNG to have the SVGs in the skin converted to PNG. If this is not selected, Pano2VR will output both formats. Image Output Path – This creates a folder to contain the images of the skin and by default is placed in the same location as the panorama. The default is the same folder as the default folder (images) that holds the cube face images. The name of this folder can be changed. Clicking Open… will let you choose a specific location. File – This is the output file path. You can change its location and name of the file by clicking the folder icon to the right. The default is to output the file in the same folder as the original image. 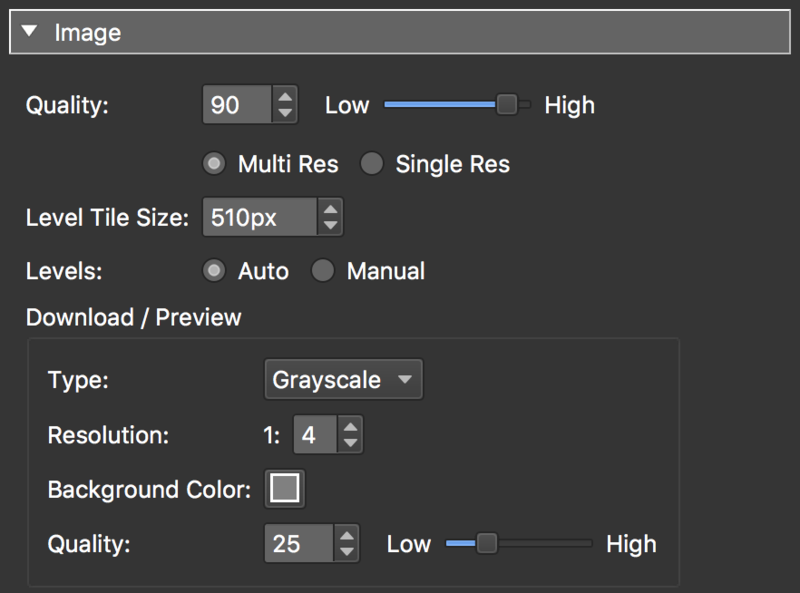 Multiresolution allows you to break an image down into multiple levels (or layers) so that every zoom level has good resolution. Filename – Here, you can choose the naming convention of the tiles. The naming convention is created with placeholders and choose from the list or build your own. Bias = -1 - A negative setting will change the tiles when there are 4 image pixels to 1 screen pixel. Zooming in will cause the visible tiles to change just before there are 4 image pixels to 1 screen pixel. Zooming out, the tile will change just before there are 2 image pixels to 1 screen pixel. Bias = 1 - A high bias number will change the tiles sooner and will produce aliasing, and will increase processing load. Zooming in will cause the visible tiles to change just before there is 1 image pixel to 1 screen pixel. Zooming out will change the tiles just before there is 0.5 image pixel to 1 screen pixel. Bias = 0 - Zooming in will cause the visible tiles to change just before there is 1 image pixel to 2 screen pixels. Zooming out will change the tiles just before there is 1 image pixel to 1 screen pixel. Switch HiDPI Bias – This setting is similar to Switch Bias except it is for high resolution displays and ensures better viewing of high resolution images. Here, you can add the file paths of external media. External media is usually called for in a skin, like the gallery component. On output, Pano2VR will copy the media from these locations to an Assets folder within the Output folder. Folders will be added as subfolders to the Assets folder. Double-click in the table or click the plus to the right to navigate to a file or folder to add the file path. ✭ Assets are also included in the Garden Gnome Package output.